"Fashion is an instant language and your handbag talks most of it." 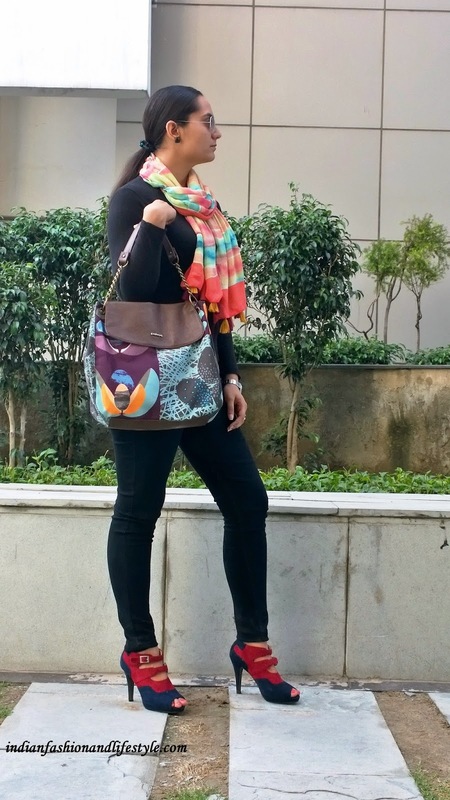 Handbag and high heel are best friends since ages as they play an important role to make that mark. Couple of days before I was walking down the street heading towards my home and suddenly there was a girl who came behind me and said: Excuse me! I turned to her and then she just smiled and said nice bag dear, I like it! I replied Thanks! and then we both went to our different ways. I didn't know her neither she knew me, but that complement made my day. I walked to my place smiling and happy. 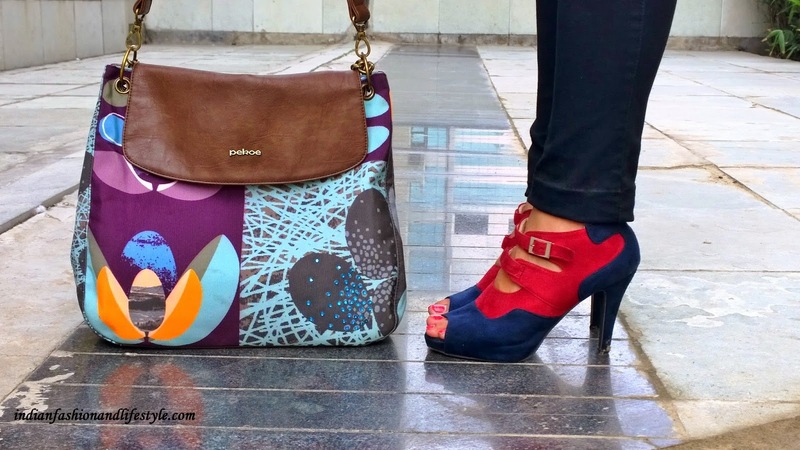 Today' OOTD post is about my pekoe handbag which is printed. Lets talk about the look: I am wearing a black jeans with black round-neck full-sleeves T-Shirt. To accessorize I have used a scarf which I got from Saiesta.com with heels. Talking about the scarf its is made of chiffon fabric . 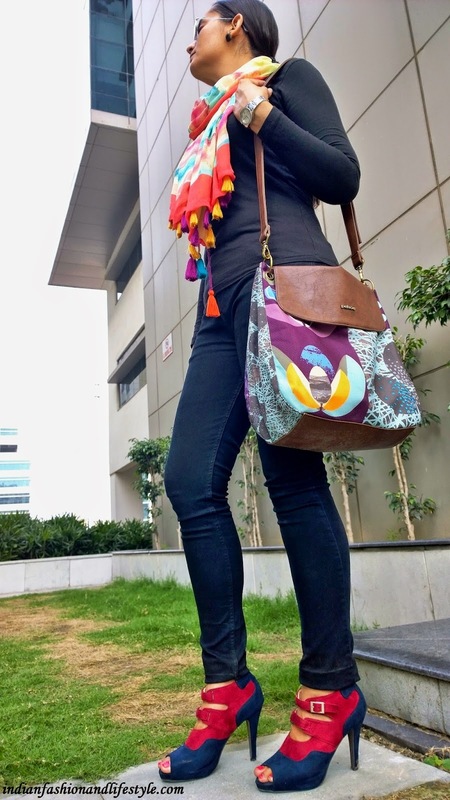 It is green color from one side and other side is printed, so basically Two different chiffon pieces are stitched together to make one scarf with vibrant and interesting tassels. 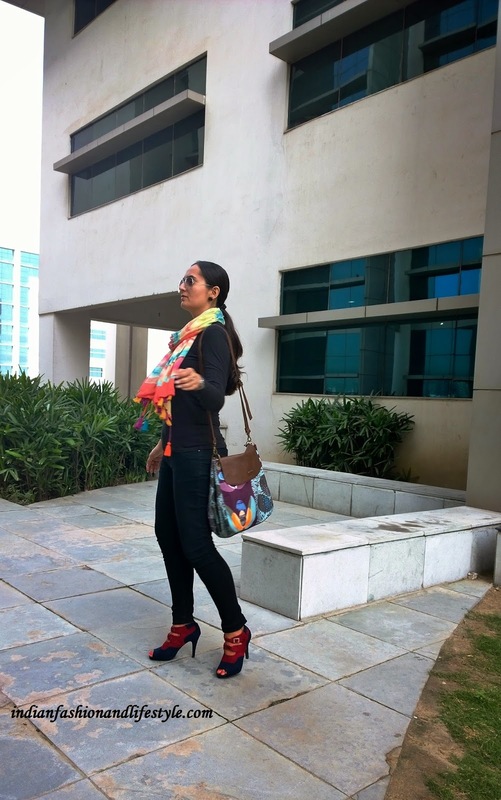 I have talked about different ways of wearing a scarf here->> LINK! I am carrying my printed handbag which I bought from choies.com. They have amazing collection of apparels, handbags and accessories.It is your one stop shop which has just what you want. Saiesta presents exclusive authentic designs that you will love to flaunt. They handpick Traditional Designs and fuse them with Trendy Western Silhouettes to create unique concoction of Innovative Fashion and Authentic Craftsmanship at affordable prices!You can use discount code "7PWIR" to get exclusive discount from saiesta while shopping there product. 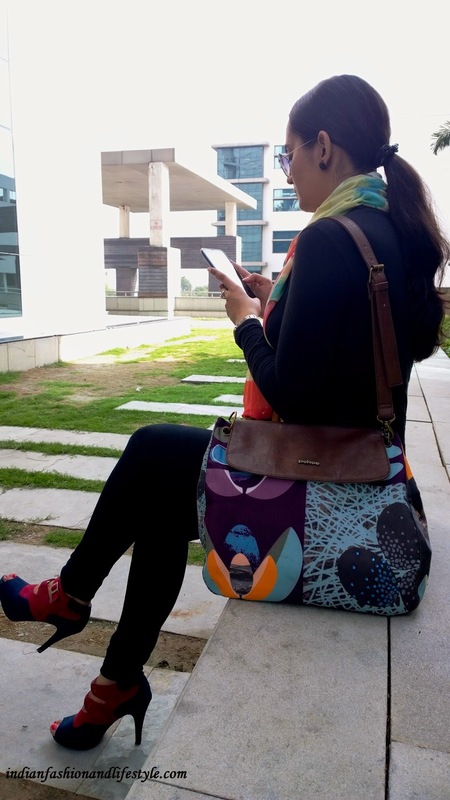 The best part of this bag is it can be carried as a sling bag as you can see in above picture. You can easily adjust the size of the sling according to your height. Where are you stuck? My bag or my heels?? I know you like my heels. Tell in the comments below you thoughts about the look and my handbag. I thank my friend Mayank for helping me out with the pictures. Follow us on Instagram, Pinterest , Facebook and twitter to get regular updates. Hi sweetheart, what amazing shoes. I really love them. Nice post,i love beautiful look, amazing shoes! beautiful bag! i loved you scarf too! Wow Manasi.. u look great.. loved all yr accessories ! !